Often the best solution looks different than expected—it may appear unconventional and even revolutionary. Having the ability to see beyond the tradition of competition, rivalry, opposition, and fear enables corporations to partner in ways that are creative, successful, and go beyond mutual benefit to create profit and abundance. 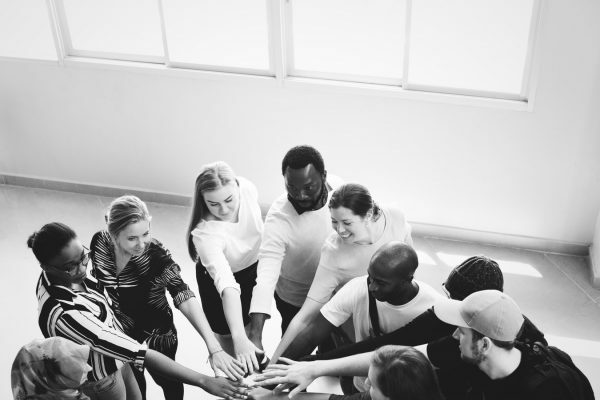 Collaboration in creative ways produces collective benefit to expand benefits from the partners to those they connect with and the larger collective as a whole. Today’s world is changing—that includes the way individuals do business, the way consumers shop for and choose products and services, and the way patrons conduct personal transactions. There’s no mistaking the way Amazon’s market entrance and business model impacts the way these changes materialize. In fact, the term, “Amazon Effect” was coined to describe the influence Amazon activated in the marketplace. These changes are significant and wide-spread, considering declining sales and retail store closures are primarily attributed to the Amazon effect. Stores like JC Penney, Macy’s, Sports Authority, Toys ‘R Us, Kmart, and Sears are a few of the large players that succumbed to the retail apocalypse. There’s no shortage of industries recognizing, destructing, and capitalizing on the aftermath of the Amazon effect; including book stores, grocery stores, retailers, department stores, food delivery services, and even pharmacy and health care companies. Much of the growth in these industries is the result of partnerships Amazon crafted with giants like Whole Foods, Grub Hub, PillPack, and Warren Buffett’s Berkshire Hathaway and JPMorgan Chase & Co.
One partnership that’s fairly new to the scene (fall of 2017), is a venture among Amazon and retail leader, Kohl’s Department Stores. Given the tangible and considerable threat Amazon presents to retail stores, it’s unorthodox for Kohl’s to welcome a partnership with a competitor—a rival even—like Amazon. As competitors, Amazon and Kohl’s jockey for position and Amazon emerges as a clear winner. In a competitive scenario, a loser is inevitable. However, through collaboration, Kohl’s and Amazon directly benefit their own business, overlap their resources and networks, and better serve their customers. In other words, not only do Amazon and Kohl’s win as collaborative partners; but the larger, collective customer base does as well. Amazon customers can return unwanted products to Kohl’s without packaging the item or paying return postage. When arriving at Kohl’s, Amazon customers park in reserved, designated parking spots at the front of the store. An Amazon return station is placed at the entrance where returns are processed quickly. Even better; thanks to technology, the customer’s refund is processed immediately when the return is accepted by Kohl’s—instead of waiting days for delivery of the item to Amazon before refunding. Here’s where it gets creative and provides additional advantages. The biggest benefit for Kohl’s to process the refunds is to bring traffic to their stores. To keep (and profit from) the new traffic, Kohl’s provides Amazon return customers with an in-store coupon while processing their return. Coupons are up to 30% off an entire purchase, and encourage patrons to spend their immediate refund (and more) at Kohl’s. When individuals and companies leverage strengths, they relinquish the need to maintain control over every aspect of their business. With this slight release, they can achieve greater synergy when they recognize and capitalize on the fact that individuals or companies may have more expertise in specific areas. A business’s chief strength remains with their customer base and is extended to their suppliers. At a glance, the prospect of sharing or overlapping clients and key business contacts is a risk. However, the idea of risk is born out of a scarcity mindset. Fear assumes there’s not enough business for both partners. In addition, this potential risk doesn’t account for the prospective rewards of partnering with abundance, efficiency, and synergy in mind. Further, a fear-based response and failure to try an out-of-the-box solution can never reap collective benefits. Sure, a mutually beneficial partnership is desired. However, a collectively beneficial partnership takes it one step further. In this way, it’s not about Amazon, or Kohl’s—but how this partnership can serve the large collective—their customers and the economy as a whole. As a customer who personally experienced this partnership, I can confidently claim the return process was fast, easy, and advantageous for me. I was also an ideal consumer—one who did more than just drop off a return. I shopped and spent more than I planned at Kohl’s, thanks to the in-store coupon and overall great service. I shop frequently on Amazon and on occasion need to return items. I can honestly say I much prefer the Kohl’s return over the other options. In my book, this win-win solution goes beyond mutual benefit to Kohl’s and Amazon to benefit the collective—in abundant, and likely new ways yet to be revealed. Melissa Drake is a consultant who helps businesses, individuals, and organizations refine business processes and manage their brand presence for depth, radiance, and resonance.